This Sender » Relay Restrictions tab lets you tell VPOP3 about any restrictions your ISP may have for sending messages. 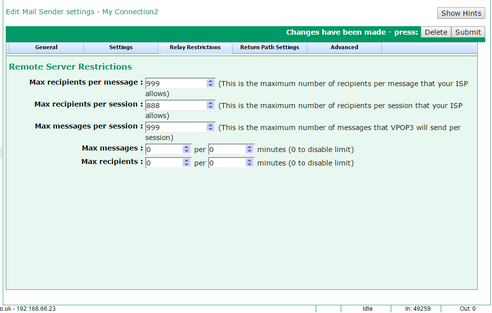 The Max Recipients per Message setting tells VPOP3 how many recipients to specify per message that it sends out. . If you send a message to 100 people, and you have set this value to '15' to meet your Internet provider's requirements, then VPOP3 will send the message out 7 times, 6 times to 15 people each, and once to the remaining 10 people. The Max Recipients per Session setting tells VPOP3 how many recipients are allowed in a single session connecting to the Internet provider's mail server. After this number of recipients has been reached, then VPOP3 will drop the session and not send any more messages until the next scheduled connection. 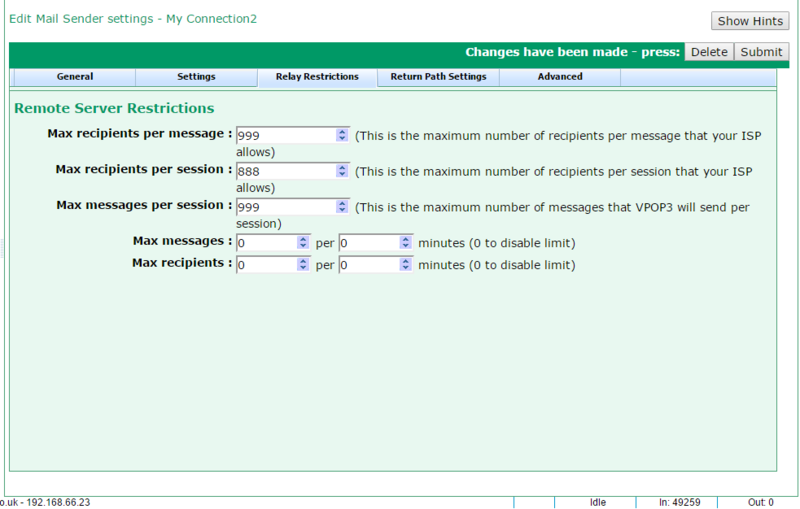 The Max Messages per Session setting tells VPOP3 how many messages are allowed in a single session connecting to the Internet provider's mail server. After this number of messages has been reached, then VPOP3 will drop the session and not send any more messages until the next scheduled connection. The Max messages: X per Y minutes and Max recipients: X per Y minutes options let you set limits for how many messages or recipients can be sent in a particular time. So, for instance, if your ISP limits you to 1000 messages per hour, you could set Max messages: 1000 per 60 minutes. VPOP3 will simply not send any more messages after it has sent 1000 within 60 minutes, until some messages were sent over 60 minutes ago, then it will send more messages until it reaches the limit again. This will not allow you to bypass any limits placed by your ISP, but it will prevent error messages being generated and possibly messages being rejected and having to be resent.